Leonardo Nascimento de Araújo, known simply as Leonardo (born 5 September 1969 in Niterói, Brazil), is a football manager and a former midfielder, serving as head coach of Internazionale. He played for Brazil, and formerly served as manager of Italian side Milan. He played in the 1994 World Cup winning side, as well as the runners up team in 1998. Later that year, he made the switch to European football, signing with the Spanish club Valencia CF. After two seasons with Valencia, he returned to Brazil for a brief stint with São Paulo in 1993, during which time the team won several titles, including the prestigious Copa Libertadores and International Cup. In 1994, after the World Cup, Leonardo signed with the Kashima Antlers of the newly-formed J. League. Leonardo continued his success in Kashima, again playing with his idol and friend Zico. In 1996, he returned to Europe, this time signing with French club Paris St Germain, where he again proved to be successful, one of his goals helping them to oust Liverpool out of the semi-finals of the UEFA Cup Winners' Cup. At this point in his career, Leonardo had mostly stopped playing as a leftback and moved into the midfield, sometimes on the left, sometimes as a playmaker. Already in Japan, this had resulted in some spectacular goals for Leonardo, a trend which continued in Europe. In the summer of 1997 he signed with Italian team A.C. Milan, for 8.5 million euros from PSG. With Milan he became a prominent part of a star-studded lineup. He played four full seasons, scoring 22 goals and playing 177 games for Milan, before returning to Brazil with São Paulo FC and Flamengo. He later returned to Milan and finished his career with them in 2003. 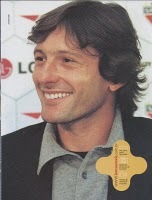 Leonardo made his international debut in 1990. He was selected as a leftback for the 1994 World Cup, keeping the young Roberto Carlos out of the team, much to his chagrin. Leonardo played well in the first games but was then given a four-match suspension for elbowing the American midfielder Tab Ramos, resulting in a broken malar bone. The stricken Ramos had to stay in hospital for three and a half months afterwards. Leonardo's suspension prevented him from participating in the remainder of the competition. It was the second longest ban imposed in World Cup history, after Mauro Tassotti's eight-game suspension for breaking the nose of Luis Enrique at the same tournament. In 1997, Leonardo was given the Number 10 shirt for the national team. He was an important member of the team that won the Copa America in 1997. Leonardo played all seven games in his second World Cup, helping Brazil to a second-place finish. In the second opening round match against Morocco, he netted one shot and began celebrating, but was later called off-side. He was last selected to play for Brazil in the 2002 World Cup qualifying campaign and ended his career with 60 caps and 8 goals for Brazil. Since 2002, Leonardo has dedicated himself to social works with the Fundação Gol de Letra and Fondazione Milan. Leonardo worked for BBC Television in the United Kingdom during the 2006 World Cup, as one of their Match of the Day analysts, alongside another former World Cup winner Marcel Desailly. He appeared again as a Match of the Day analyst on 1 June 2007 alongside Alan Hansen and Alan Shearer. This was the first England game at the new Wembley Stadium finishing 1–1 with Brazil. Since Leonardo stopped playing for Milan he has become a sort of combination of scout and agent for the club in Brazil and the great respect he enjoys in his homeland has helped Milan to land several world-class players. He was instrumental in the process of getting Kaká to Milan and in July 2007 it was revealed that Leonardo had been one of the main factors in convincing Alexandre Pato to sign for Milan. In December 2007, he was interviewed for the vacant position of director of football at English Premier League side, West Ham United. 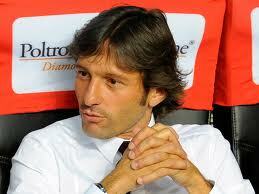 In early 2008 he was appointed Technical Director of his former club A.C. Milan. Later the same year he obtained Italian citizenship, after twelve years in Italy as a resident. After Carlo Ancelotti left Milan to become the manager of Chelsea F.C. 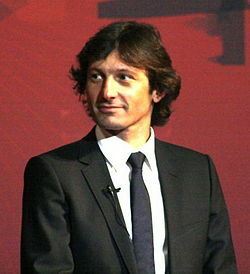 at the end of May 2009, Leonardo was named head coach of Milan despite still lacking the required coaching badges (he was set to attend a UEFA A coaching course on June 2009). He was however exempted from requiring a UEFA Pro license, which is mandatory for Italian Serie A managers, due to being a former World Cup winner as a player. Leonardo wasted no time in declaring that he wanted his team to play attractive attacking football, even invoking the name of his old mentor, Telê Santana. After a poor start of season, featuring a shock 0–4 loss to crosstown rivals Internazionale, that started speculation about his possible dismissal from the head coaching post at Milan, results started improving for the rossoneri under Leonardo, also thanks to the application of a 4–2–1–3 tactic (nicknamed also "4-2-fantasy" by Milan vice-president Adriano Galliani). This tactic, quite unusual on Italian football, and greatly focusing on creative players such as Ronaldinho, Andrea Pirlo and Clarence Seedorf, led Milan to improved results at both Serie A and UEFA Champions League level, including a remarkable 3–2 win at Santiago Bernabeu Stadium against Real Madrid and a 3–0 away win to Juventus which enabled Leonardo's side to finish in second place at the half-way point of the season, six points shy of leaders Inter with a game in hand. However, the path to UEFA Champions League final was halted prematurely as Milan was eliminated in the first knockout round by Manchester United in a 2–7 aggregate loss (2–3, 0–4). In the final weeks of the seasons, it was speculated that Leonardo could leave Milan at the end of the season. In April 2010, Leonardo confirmed divergences with club owner and Italian Prime Minister Silvio Berlusconi, defining their relationship as "difficult". It was confirmed that Leonardo will leave Milan by mutual agreement after their season ending game against Juventus. Leonardo waved an emotional goodbye to a packed San Siro, as he managed his side's last game with a 3–0 win against Juventus. On 24 December 2010, after days of speculation, it was confirmed Leonardo would take over as head coach of fresh FIFA Club World Cup champions Internazionale, replacing Rafael Benítez in a somewhat controversial move, due to the Brazilian's long career with rivals Milan as both player and manager; he agreed a 18-month contract due to expire on 30 June 2012. Inter Milan have confirmed Leonardo as Rafael Benitez's replacement, giving him a one-and-a-half-year contract as their new boss. Speculation had linked the former AC Milan coach with the position even before Benitez officially parted company with the European champions yesterday, and the Nerazzurri have now officially confirmed his appointment. The 41-year-old, who had one season in charge of Milan during the 2009/10 campaign, will officially start work with the Serie A champions on Wednesday. A statement on the club's official website, www.inter.it, read: "Welcome to Leonardo. It will be the Brazilian coach to lead the team from December 29. "Leonardo has a contract that will bind him to Inter until 30 June 2012. "For Leonardo, the most sincere and good luck, we believe that he has the class and experience of a champion and his mentality will get the team together to get results." Club president Massimo Moratti had insisted earlier that he would not be naming Benitez's successor until after Christmas, but has now reneged on that to appoint the former World Cup winner. Leonardo takes over a side that are in seventh place in Serie A, 13 points behind leaders Milan. Apart from attempting to bridge that gap, one of his primary tasks will be attempting to retain the Champions League when the competition resumes in February. Inter must overcome Bayern Munich over two legs if they are to stand a chance of keeping the trophy they won when Jose Mourinho's side beat the Germans in May. Benitez's six-month stay at the San Siro was officially ended on Thursday. Despite lifting the Italian Super Cup and the FIFA Club World Cup during that time, the Spaniard had struggled to adapt to life as the popular Mourinho's successor, and seemed to issue Moratti with an ultimatum over transfer funds earlier this week. That led to the breakdown of his relationship with Moratti, who, after Benitez left the club, was quoted as saying: "I'm sorry the relationship with Benitez is over, but the split had now become inevitable." Leonardo's first meeting with his former employers is scheduled to take place on April 3. Yesterday, Milan's vice president, Adriano Galliani, admitted it would be strange to see Leonardo in blue and black. "I do not know what my reaction would be," he said. "He certainly has an important history with Milan. He made a career with AC Milan; first as a player, then as a coach and a manager." eir fingers...Jose Mourinho believes Leonardo is the right man to lead Inter into a new life following Rafael Benitez's brief tenure. The Brazilian will be unveiled officially on Wednesday, and Mourinho, who led the club to a unique treble last season, has told them not to waste the chances they have with 'Leo' in charge. "He is great, support him the way you did me," the Real Madrid coach told La Gazzetta dello Sport. "Leonardo is great. I ask the Inter fans to welcome and support him the way they did with me. "Last season Leo proved he is a coach of real potential. He is a great professional and not to be tagged as a Milanista. He dedicated many years to Milan and will now do the same for Inter with the same passion. "I really do wish him every success. Please support him. Inter could become further tinged with Milan's colourful history as Leonardo wants Paolo Maldini to join him on the bench. The former Rossoneri coach has penned an 18-month deal with the option for a third term at San Siro, and has already outlined his plans. La Gazzetta dello Sport claims Leonardo, who is already chasing Kaka of Real Madrid, will ask president Massimo Moratti to lure Maldini. Moratti is an admirer of the ex-defender, who retired from football in May last year. It's not clear what role Maldini would undertake, but his experience could go hand in hand with Leonardo. Maldini would then likely be used to convince Kaka into joining. Reports earlier suggested a loan deal could suit the Brazilian playmaker. Inter goalkeeper Julio Cesar has given his support to new coach Leonardo and is confident that his compatriot will succeed at the Nerazzurri. The Brazil international custodian believes Leonardo is the right man to get the Italian and European champions back on track. “He will be great,” Julio Cesar told Globoesporte. “He is the right man for Inter and he is also my friend. Julio Cesar played an integral role in helping the squad win five titles including the Champions League and the Scudetto in 2010 and says that lifting the World Cup with Brazil would complete the set. “Now I just need the World Cup with Brazil to complete the set and hope to achieve it as the host nation in 2014,” he said. Inter president Massimo Moratti has explained why he decided on Leonardo as the man to replace Rafael Benitez at the helm of the Nerazzurri. Leonardo was appointed the coach of the Italian and European champions on Christmas Eve in a sensational move as the Brazilian was the tactician of Inter's city rivals Milan last season. However, Moratti claims that the 41-year-old's appointment has nothing to do with putting one over the Rossoneri. “I thought it would be nice for the fans to spend Christmas knowing the name of their coach," he said, according to Il Corriere dello Sport. "It seemed to me a good present for them and the supporters certainly deserve it. I have respected and admired Leo for many years. "When it became necessary to replace Benitez, he was free from contracts and it allowed him to join us without the need for further negotiations. The Inter supremo added, "I did not choose Leonardo to irritate Milan. I chose him because he has talent and can achieve great things with Inter. Leonardo celebrated a winning start as coach of Inter Milan with a 3-1 win against Napoli at the San Siro. Thiago Motta was the hero for the home side with the first and the last goal in a pulsating game. He put Inter ahead after three minutes, but Michele Pazienza deservedly levelled for an impressive Napoli in the 25th minute. Esteban Cambiasso restored Inter's lead in the 37th minute before Motta's second sealed the win and allowed Inter to start eating into their huge deficit on league leaders AC Milan. With two games in hand, they are now 13 points behind their city rivals, but they appear to be filled with renewed belief and enthusiasm under their new coach. Leonardo could hardly have wished for a better start as Motta gave the Nerazzurri the lead in the third minute. The player who was rarely able to help Leonardo's predecessor Rafael Benitez due to injury was involved twice in the goal, touching a pass from Goran Pandev to Dejan Stankovic, who returned the favour and lifted the ball up for the Brazilian to volley in from the edge of the penalty area. Napoli responded immediately and had a goal disallowed in the seventh minute when Andrea Dossena drifted offside before volleying a free-kick towards the far corner, where Edinson Cavani's header to make sure the ball crossed the line made no difference as play had already been halted. The visitors did draw level in the 25th minute as Pazienza scored his first goal of the season. He ran into the six-yard box to meet a corner from the left with his head and beat keeper Luca Castellazzi, who was a bit slow to react. Napoli could have gone ahead in the 33rd minute, but Christian Maggio shot across the face of goal. Two minutes later, Diego Milito showed that his luck does not appear to have changed under a new coach as he lifted his shot over the crossbar from six yards out with only Morgan de Sanctis to beat. Cambiasso showed him how it is done two minutes later as he restored Inter's lead with a committed header from Maicon's cross, beating Paolo Cannavaro to the ball at the near post and leaving De Sanctis no chance. Marek Hamsik had the first chance of the second half as he met Cavani's cross at the near post, but he shot just wide. Motta then gave Inter a two-goal cushion with his second goal of the game in the 55th minute. He showed excellent precision to head Pandev's corner into the top left-hand corner of the goal from 10 yards out. Napoli tried to respond again, but they lacked the belief that they had shown previously and Castellazzi was rarely threatened as the Nerazzurri held on to all three points, giving Leonardo a perfect debut as Inter's new coach. Inter Milan chief Ernesto Paolillio has confirmed interest in Napoli duo Edinson Cavani and Marek Hamsik. The Napoli pair have helped fire the club into second in the Serie A table - 10 points ahead of Inter - and there is growing speculation the champions could launch a bid in the January transfer window. Paolillo told Radio Crc: "Cavani and Hamsik are two very good players and certainly I'd like to see them play for Inter, as indeed I think all clubs would love to have them on their roster. "We have made other choices of corporate strategy and this is why we haven't invested on them but now it is appropriate to look to the future." On Thursday night, new Inter manager Leonardo will get a first hand look at the players in question when Napoli travel to the San Siro. Julio Cesar is out with a thigh injury and is replaced by Luca Castellazzi, Wesley Sneijder is a long-term absentee while Samuel Eto'o is banned. Inter Milan are set for an audacious bid - to offer Samuel Eto'o for Manchester City striker Carlos Tevez. New Inter manager Leonardo wants his very own strike force at the San Siro and has earmarked the City hitman as his number one target. The Argentinean has recently made an about-turn in regards to his future at Eastlands after demanding a move out due to unhappiness at the club and family concerns. But that has not dampened Leonardo's hopes of landing the 26-year-old and is ready to dangle Eto'o at the face of the cash-rich Citizens. Meanwhile, City are on the brink of signing Wolfsburg striker Edin Dzeko after the Bosnian completed his medical on Thursday. His arrival could loosen the club's grip on Tevez. Inter Milan's technical director Marco Branca has distanced the club from moves for Kaka and Ronaldinho. Reports have suggested that the reigning Serie A champions are keen to land the Brazilian duo this month. New Inter boss Leonardo has worked with both men before at cross-city rivals AC Milan and was believed to be looking to snap up his fellow countrymen. However, Branca insists there is nothing in the speculation and is adamant neither player will be turning out for the Nerazzurri any time soon. "Kaka? We have never given any consideration to such an eventuality," he said. "Ronaldinho? When I read this in the morning I thought it was more a media necessity to fill space, rather than serious news. "If we never thought about Kaka, then we certainly did not consider Ronaldinho." Branca claims Inter are unlikely to enter the transfer market again until the summer, but concedes the club are among those keeping a close eye on Udinese's Chilean forward Alexis Sanchez. "Sanchez? I have a 23-year relationship with Udinese and we have never had any problems, but I said before our market will go forward in June," he added. "Inter are following him, but there are also other clubs. For now we are OK as we are." Inter Milan manager Leonardo has set his sights on retaining the Scudetto following a dream debut against Napoli. Leonardo got his Inter career off to a credible start with a 3-1 win over a combative Napoli side at the San Siro on Thursday night. Inter are now 13 points behind league leaders and city rivals AC Milan, but have restored title belief under new manager Leonardo following a bad spell under ex-coach Rafa Benitez. "It will not be easy, but possible," Leonardo was quoted on the club's official wesbite as saying. "We need to think game by game, taking a step at a time. "The team is there and has a soul. "This team has a heart too strong, there is only one center, one priority." Thiago Motta was the hero for the home side with the first and the last goals in the 3-1 win. He put Inter ahead after three minutes, before Michele Pazienza deservedly levelled for Napoli. Esteban Cambiasso restored Inter's first half lead before Motta's second sealed the win. "Fabiano will consider Inter Milan"
Sevilla hotshot Luis Fabiano will welcome a move to Inter Milan in January after falling behind the pecking order in the club. The Brazilian sharpshooter has found himself overtaken by strikers Frederic Kanoute and Alvaro Negredo ever since the appointment of Gregorio Manzano as Sevilla manager. Fabiano's agent Jose Fuentes has now revealed that new Inter chief Leonardo is a firm admirer of his client's talents and should the European champions come calling with a offer, the former would evaluate the situation despite having committed himself to the Andalusian outfit earlier in the season. "Yes, it's true. Leonardo has always followed Fabiano in recent years, and when he was the coach of Milan," Fuentes told Ilsussidiario.net. "At the moment we have had no contact from Inter's officials. He [Fabiano] has a contract with Sevilla, but if a concrete offer came from Italy, Spain or England, we would be willing to evaluate it if it's a big club," the agent stated. Fabiano, who was linked with a move to Manchester United and Spurs during the transfer window in the summer, pledged his future with Sevilla after no moves were forthcoming. Inter Milan tactician Leonardo complimented his troops after they secured a 2-1 away win at Catania on Sunday. Though the home side took the lead thanks to an Alejandro Gomez goal, Argentine anchorman Esteban Cambiasso notched a brace to ensure Leonardo's second consecutive win as Inter manager. "We did not give away too many chances in the first half. When we brought Pandev on the team took a more attacking attitude although this presented several opportunities to Catania," Leonardo told Sky after the game. "We saw another fundamental characteristic of a great team, the heart. We won even though not at our best but against Napoli there were more ideas." The European champions' triumph has seen them cut the gap between themselves and table toppers AC Milan to 11 points after the latter played out a thrilling 4-4 draw with Udinese.